QQC has a dark offering to stuff in your stocking this season with this off-kilter episode where we consume the cookie-compatible Black Christmas After Eight cocktail. It seems like we've been off for decades! On the season three premiere of QQC we look back at the ridiculously decadent era that was the 1980s. Live from a recording studio covered in cellophane, it's a serial killer-themed episode of QQC where we imbibe on the inky and lethal Dark Passenger cocktail. Are you still thinking about the Oscars? 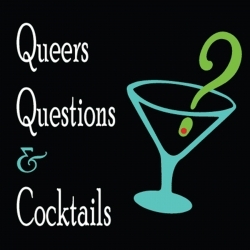 Well, you are now so why not join QQC on the red wine carpet for our belated Academy Awards-themed episode starring the Los Angeles Slingshot cocktail.